Owen Garriott entered this world on November 22, 1930 in Enid, Oklahoma and left it for the first time on July 28, 1973 when a Saturn 1-B rocket propelled him to the new Skylab space station, where he was to live for the next three months. Having received a BS in Electrical Engineering from the University of Oklahoma and his MS and PhD in Electrical Engineering from Stanford University, Owen joined the elite group of NASA astronauts in 1965 as a member of "Group 4." Following his trip to Skylab as a member of the Skylab 3 mission, Mr. Garriott next rocketed into space 10 years later aboard the Space Shuttle Columbia as a Mission Specialist for STS-9, the first of the Spacelab missions. I had the opportunity to speak with Mr. Garriott on February 7, 1998. Following is a transcript of that conversation. Jim Plaxco (JP): With your long association with the space program, what are your feelings about the state of space exploration today? Owen Garriott (OG): It's struggling along. We are finally getting to the point where the space station is about to become a reality, which has been roughly a 10 year building effort since the contract was first approved back in late 1987. Its been a very long time in coming but now the next few years should see most of the space station put together, and we're beginning to see some interest in the additional science that goes with planetary exploration. So things are coming along but we are spending too little on it - less than one percent of the federal budget whereas at the peak of the Apollo years, it was more like three percent of the federal budget. So, in terms of the government's effort, it's running roughly one third what it was in the early 1960's. So I have those problems with it but we are making progress. It's still a lot of money, but it's still a substantially smaller fraction than what we used in the early days of Apollo. JP: Were your surprised by the extent to which we have become involved with Russia in joint efforts in space exploration? OG: No, I'm not surprised and also I am pleased by that. I think that the joint effort is quite a good one. I think it's a very wise thing for NASA and the government to have done; to involve ourselves with the Russians, who obviously are a very strong space power in terms of their capability. They have all of the space records in terms of human endurance. They've had a space station which has been continuously manned for over 10 years and has worked well beyond its design lifetime. There is a lot they can bring to the joint development of the space station. From a political standpoint, which I am not at all an expert on, it seems to me to be a good idea. It's much better for us to be cooperating with the Russians in space than competing in a military arena for example. So, I think it does a lot to benefit our country, both from an overall political perspective as well as from the specifics of working together in an area in which the Russians have a lot to contribute. JP: From your recollections, what was the best part about being in space? OG: The experience itself was probably the best part. There are several things that are so unique about the space experience that they just really stand out. The two that I am going to mention are both quite obvious. The first thing is the perspective - the ability to see things from altitudes of 400-500 kilometers above the earth's surface - the great dimensions for your view or perspective, the beautiful things that can only be seen from space: whole hurricanes from edge to edge; aurora from the top instead of from just the bottom; clouds and storm structures in their entirety; major geological features. You can see the entire arrangement, connections that are not possible when you are down on the surface. So the viewpoint from space is perhaps the strongest impression and the most impressive thing that the space environment provides. The second experience is the weightless environment - where you can really float freely and become really adapted to the space environment as you do in most cases after a week or two in space. You can manage your body and do aerobatics and all types of activities that you can only dream about being able to do when you are earthbound by the one gee gravitational field that we all experience here. So those are the two things that really make space unique. First of all, the perspective; second, the lack of gravity to hold you down. JP: You've flown twice in space: once aboard Skylab for two months with two other fellows, and the second time aboard the space shuttle with five other people for ten days. What really struck you about the differences in the nature of the two types of missions? OG: I would say that the most distinctive difference was just the thing you pointed out - the duration. When you can fly for sixty days, you can operate somewhat more slowly and have the opportunity to iterate on the experimental work that you are doing. You make a new observation, perhaps one that you hadn't expected - you have a chance for the principle investigators on the ground to see it, talk over that result with them and create a second generation experiment that takes advantage of that observation. Or you may complete a test and get either an expected or unexpected result - you have a chance to talk it over and settle on what the next step or test should be right while you are in space on the same flight. On shorter flights, you come back, analyze the data, and it may be two or three years before you have a chance to get back in space to do the second generation experiment. So the longer flights are in some ways much more productive because you can iterate on your experiment results and take the second or third step; something that you would not have time for on the shorter flights. JP: When you came back from the Skylab mission, how long did it take before you felt like you were back to your old self and fully recovered from the effects of the space environment? OG: In most ways, you recover rather quickly. The area that most people are curious about has to do with your sense of balance and your vestibular system. It takes typically three to six days before you've adapted to a weightless environment. Then, as it turns out, it takes three to six days when you come back home before your sense of balance seems perfectly normal. For example, I remember a peculiar, humorous incident that happened on both flights. After coming back from space, I went to go to bed the first night. I flipped the light switch off and then I realized I couldn't walk back to my bed because I had no way of determining what was up and down because the lights were out and I couldn't see. I had to turn the light back on, then go over and turn on a light next to the bed, then turn the wall light off and then turn the light next to the bed off once I was actually sitting on the edge of the bed. In space, you have forgotten your vestibular system. You don't have your sense of feel, your proprioceptive senses to tell you what's up and down, so you rely entirely on your eyes and that happens after being in space for three to six days. You get the same thing coming back out - it takes several days before you have once again learned to use your vestibular system to tell you what's up and down after the lights are turned out. So it's typically just a few days, either going into or coming back from space, before that particular system of your body has readapted. Other parts of your body, like your blood system, may take several months. For example, the red cells in your body have been adapted for the right concentration for a weightless environment. When you come back, you are typically somewhat anemic, a little bit low in the number of red cells, and it will take two to three months before your count is back to normal because that is the lifetime of a red blood cell. JP: What was the biggest challenge you faced on either of the two missions that you flew? OG: I can't think of any particular challenge to comment on. We did an awful lot of training for off-nominal situations. 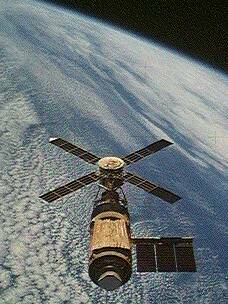 For example, in Skylab we had rendezvous problems, thrusters went out, but we were trained to manage the spacecraft with a reduced number of thrusters available. We had to make repairs, but we had done training underwater in the Neutral Buoyancy Tank to learn how to handle those kinds of difficulties. I can think of no particular challenge that we had not, to some degree, anticipated the possibility of. We were comfortable with all the work that we were called upon to do. JP: What do you think of some of the new directions today: the calls for increased commercialization; cheap access to space; trying to make space travel less of an elitist type activity? OG: There will be expanded opportunities starting with the least expensive and simplest things to do, like zero-g flights. Parabolic flights can be done in an airplane right now. They do require aircraft to be modified in special ways but I think we will see zero-g flights available to the public, maybe within the next year. Following that, there are attempts to build rocket ships that can fly to the edge of space on suborbital flights, the way Shepard and Grissom did on the first two Mercury flights. I think they will be coming along and I think there will be opportunities for private passengers to fly on those within the next several years. Eventually, I'm sure there will be tourists in space staying at hotels like the space station, but that is going to be a few more years. JP: When you travel around and talk to people, what is your feeling about people's level of awareness of the space program, where it's going, and how its contributed to our lives? OG: Adults are not particularly aware of the historical things. But on the other hand, those who have some interest in space or aviation often turn out to be remarkably aware. From kids, when they studied it in class, you get remarkably good questions. When you talk to schools, all the way from say 4th through 6th graders and on up into high school, those who have an interest and those who have spent a little time studying it are remarkably aware of what's going on and have some excellent questions about the future. JP: Do you see space as a motivator in the class room, to get kids interested in science? OG: I think that it is and some of the best evidence comes from the participants that show up at the space camps all around the country. Not only our country but Canada, Belgium, and Japan all have space camps of their own. The one in Huntsville, which is my home town, graduates something like 20,000 young people every year. I have never found one yet who didn't come out happy, enthusiastic, and having had a marvelous experience. Its quite a pleasure to see them enjoying something and finding that to be such a motivator. On that same subject, I was just talking to one of the schools here in Palatine yesterday and the teachers pointed out two young boys there, both of whom happened to be named Michael, and they had some of the best questions for me, and the teachers were pointing out that until two or three months ago they had both seemed very uninterested in scholastic kinds of things and just were not interested in getting their school work done. They had no particular motivation to excel in academic work - and their studies now, based on the space activities and some of our trip to Antarctica, has completely changed their perspective. That supports the kind of conclusion you suggested in your question. It is a motivator for a lot of young people. Providing exploration activities like a trip to Antarctica or like space travel can sometimes turn kids on who otherwise had perhaps been bored with the standard classroom curriculum. Maybe they are ready to move much faster than the standard curriculum would have provided because both of these two boys, as personal examples, are bright young kids and perhaps it was one of the things that provided the extra motivation for them to move out more quickly. JP: If you had to opportunity to go up on the space station, would you be interested? OG: Sure, I'd be pleased to go. I don't expect them to provide that opportunity. There is something like at least 100 people in line right now down at the Johnson Space Center so that's a very choice assignment that many people have already been working many years for.